A perfect mixed-media art workshop for a getaway in Oaxaca, Mexico! With artist/instructor Lena Bartula. Arrive January 8 and depart January 14. 6 nights and 7 days to explore your inner artist. All-levels, including non-artists, welcome. The Mesoamerican huipil is an indigenous garment, similar to a blouse. It is woven on the back-strap loom by and for women throughout Mexico and central America, important long before the Spanish conquest. It survives today as an article of clothing that symbolizes womanhood, and identifies origins, family and village lineage. It serves to conceal and protect, yet its patterns and designs speak and reveal much about the individual creator, her experiences, beliefs and perspectives. During this five-day workshop retreat, you will be in residence in the indigenous Zapotec village of Teotitlan del Valle, Oaxaca, Mexico, where we explore the traditional meaning of the huipil and reinterpret it for a contemporary context. You will use this article of clothing as a metaphor for social and cultural identity, power of place, and express your inner artist by creating something that is distinctively yours — to hang or display, rather than to wear. 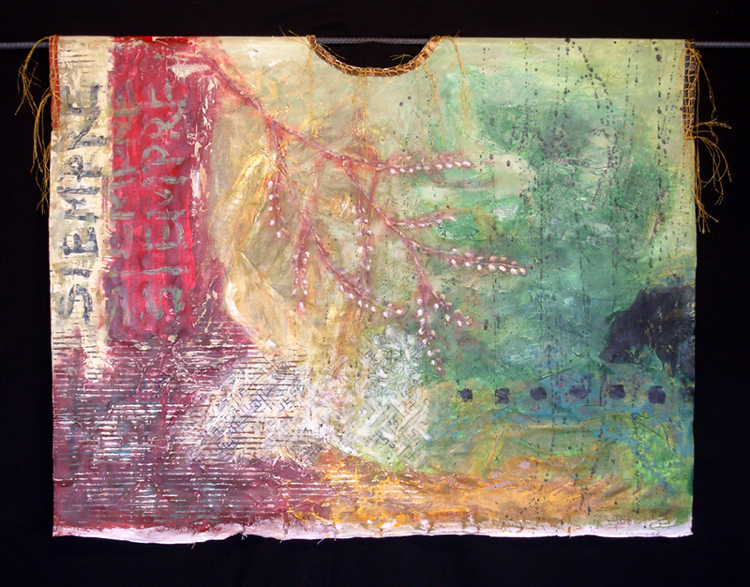 In the process of making this mixed-media art, you will review your own personal path, the journeys you have taken, the stories you remember, people you know and have shaped you, and form the stories to tell for the future. The huipil becomes your mechanism for self-expression and storytelling. As human beings, we may share similar paths or those that run parallel, intersect or diverge. Life paths digress, slow, stall, explode, or keep a steady state. By participating in this workshop retreat, the experience sparks memory and inspiration to create. You are encouraged to dream, remember, anticipate, then use an array of materials to construct the huipil. Your huipil may be made of cloth, paper, fabric or a combination, or constructed of something else entirely! You might choose to decorate it with ribbon, buttons, photos, stitching, collected objects, memorabilia, scraps. You may create a literal or abstract interpretation. There is no right or wrong way. Artist/instructor Lena Bartula will present historical reference and her own personal experiences about the huipil. She will discuss why she believes that, as both art form and as clothing, the huipil is the perfect container for artful self-expression. Day 1: Thursday, January 8: Arrive and check into our Teotitlan del Valle, Oaxaca B&B. Enjoy a relaxed evening around the outdoor kitchen where our home cook prepares fresh quesadillas with local, organic ingredients. Day 2, Friday, January 9: We join in an opening circle with welcome, introductions, and workshop overview, then hear a presentation on huipiles, their history and tradition, then see contemporary examples, including the work of the teacher and other artists. We will discuss themes, how story-telling brings alive the concepts, and share ideas from which we will begin our work. After a lunch break, we will visit the community museum and/or artisan workshops for inspiration. Day 3, Saturday, January 10: We will review and talk about what we found or learned on the first day, then begin to layout the materials and supplies to choose what we will use, and start creating preliminary sketches and designs for the huipil. 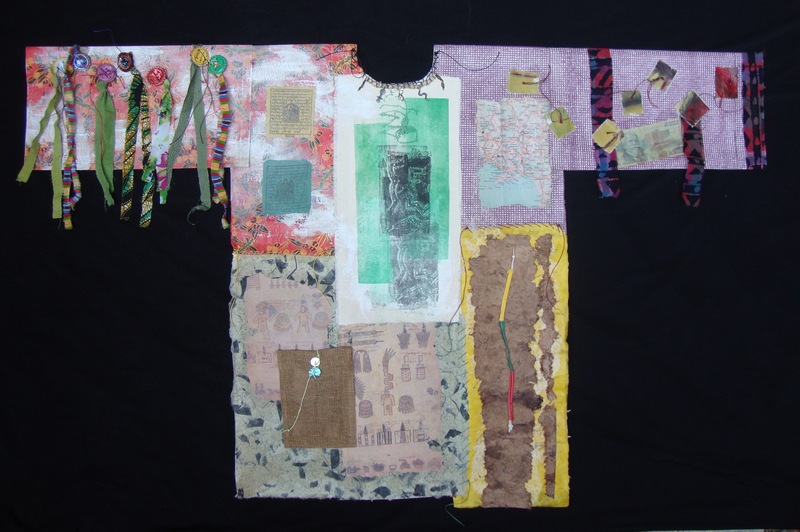 Lena will demonstrate design options, gluing techniques, collage application, painting and stitching. After lunch, you will being the huipil making process. Day 4, Sunday, January. 11: Field trip! We go to the Tlacolula market, a scavenging adventure to collect more ideas and materials, look for a wide range of representative examples of huipiles on display that come from throughout Oaxaca state and surrounding areas. The market is a great place to familiarize yourself with huipil shapes, textures, designs and colors of “the cloud people” as the Zapotecs call themselves. It’s also your best shopping adventure! After a market lunch, we return to our B&B, then gather for dinner and talk about the best of the day discoveries. Day 5, Monday, January 12: Back in the studio, we will talk about what we found at the market and decide what to and how to add them our art huipil constructions. You will continue working with access to Lena’s expertise and coaching, with more personalized instruction and demonstrations as needed. After lunch, it’s continuing to work on your project in the studio. Day 6, Tuesday, January 13: Today you put the finishing touches on your art huipil as you work toward completing the project by mid-afternoon. After lunch, we will have a group show and tell, presentation where you will have the optional opportunity to talk about your project, how it developed and evolved. Then, it’s photo time to capture the workshop in an inspiring place with new friends. At dinner, we will wrap up with a grand finale celebration. Day 7: Wednesday, January 14: We say our goodbyes and depart for home after breakfast. We’ll stitch, glue, wire, draw, collage and paint until your personal art huipil is complete and ready to go home with you. In creating our own huipil, we talk about using it as a container, where acceptance, forgiveness and transformation have a place to co-exist. 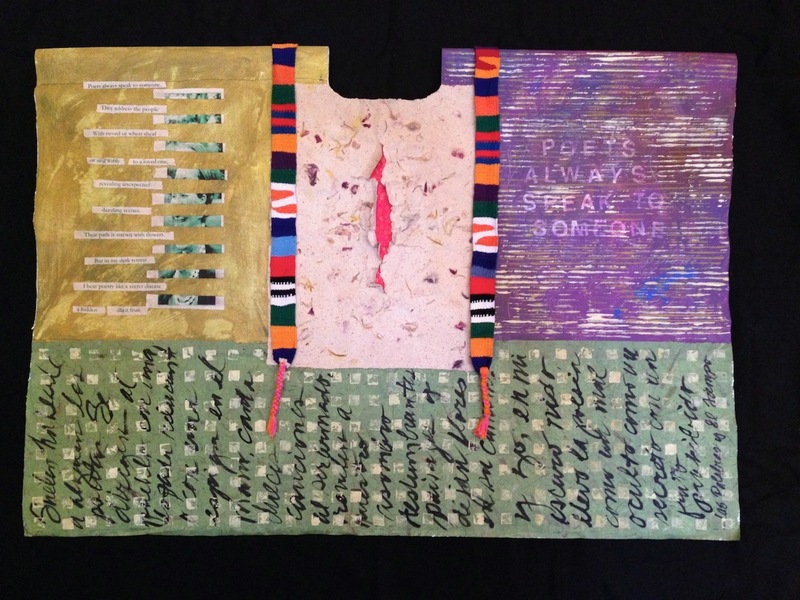 Lena’s art often combines imagery and pattern, textured layers, and words or letters in English or Spanish, inspired by her own poetry or that of other writers. The huipil, an indigenous blouse in the Mayan and Aztec tradition, called her attention to the ‘why’ of writing one’s personal and collective history in symbols. Out of this was born a series of contemporary huipiles, a tribute to women whose voices and visions have historically been silenced or suppressed. 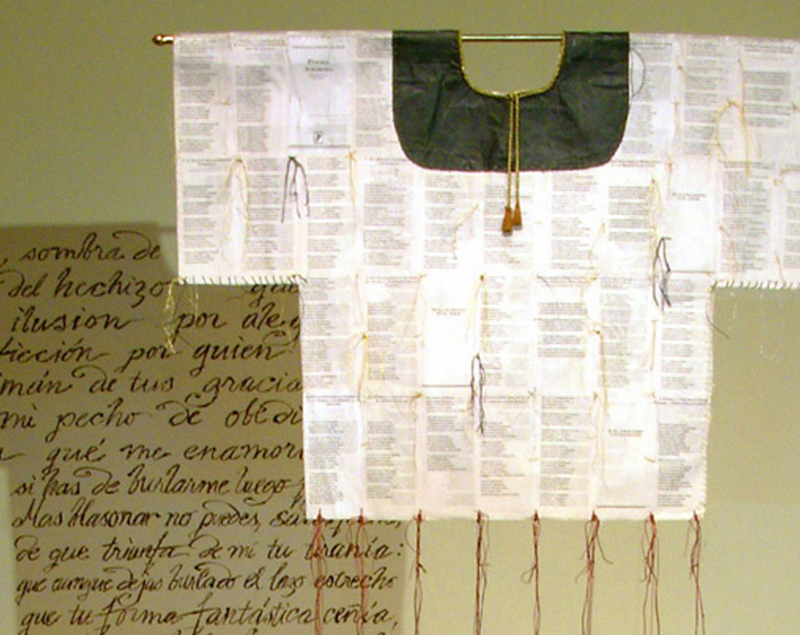 As a conceptual artist, she creates most of her work from an original idea, and after much deliberation and research, chooses her materials and techniques accordingly. 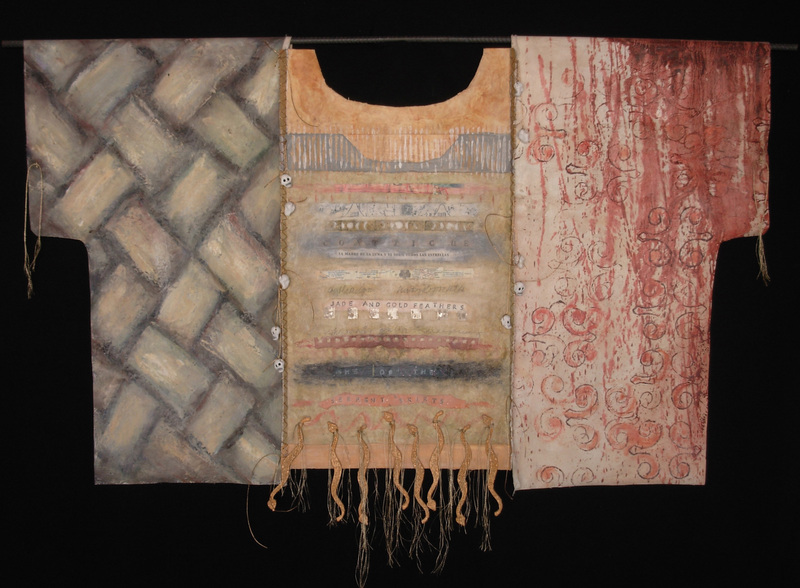 The relationship of words, like text and textile, are instrumental in formulating ideas, and although technically she is neither a weaver nor paper maker, these traditional crafts play a major role in her work on this series. Sewing has become a method of ‘weaving together’ ideas, and Bartula has been known to stitch disparate materials such as leaves, maps, plastic and corn husks. She considers art making as a way to speak of beauty, truth, spirit, joy, pain, justice, everything that this human life entails. Her works are shown in museums and galleries throughout the world, in her San Miguel de Allende, Mexico, studio/gallery, and are found in collections in France, Italy, Great Britain, United States, United Kingdom, Australia, Canada, Guatemala and Mexico. Workshop Retreat includes: all instruction, some materials as specified in the daily schedule, 6 nights lodging, 6 breakfasts, 6 dinners. Your registration fee does NOT include airfare, taxes, admissions to museums and archeological sites, tips, liquor/alcoholic beverages, lunches, transportation, and insurance. About Lodging and Sense of Place: To keep this trip affordable and accessible, we stay in a local posada/guest house in Teotitlan del Valle. The food is all house made (including the tortillas), safe to eat and delicious. Vegetarian options are available. Our workshop space is outdoors, al fresco, in the patio courtyard. We look over blooming bougainvillea to the mountain-tops beyond, There are walking and hiking trails, opportunities to visit local weavers and craft artisans, and plenty of time for reflection. Insurance Required: We require proof of international travel insurance that covers accidents, with $50,000 of emergency medical evacuation to the U.S.A. or your home country is required by all participants. Thank you for your understanding. Deposits, Reservations and Cancellations. A 50% deposit is required to guarantee your spot. The last payment for the balance due (including any supplemental costs) shall be paid by November 15, 2014. We only accept payment with PayPal. We will send you an invoice as soon as you tell us you are ready to register. If cancellation is necessary, please notify us in writing by email. After December 1, 2014, no refunds are possible; however, we will make every possible effort to fill your reserved space. Your registration is transferable to a substitute. If you cancel before November 15, we will refund 50% of your deposit. This entry was posted in Cultural Commentary, Oaxaca Mexico art and culture, Teotitlan del Valle, Textiles, Tapestries & Weaving, Workshops and Retreats and tagged art, class, conference, huipil, indigenous, indigenous blouse, Lena Bartula, Mexico, mixed media, Oaxaca, retreat, seminar, Teotitlan del Valle, women's issues, workshop. Bookmark the permalink. the area and was not sure that the best time to visit was etc. In February 2016 we are offering a mixed media altar building workshop inspired by Frida Kahlo. You might consider that.